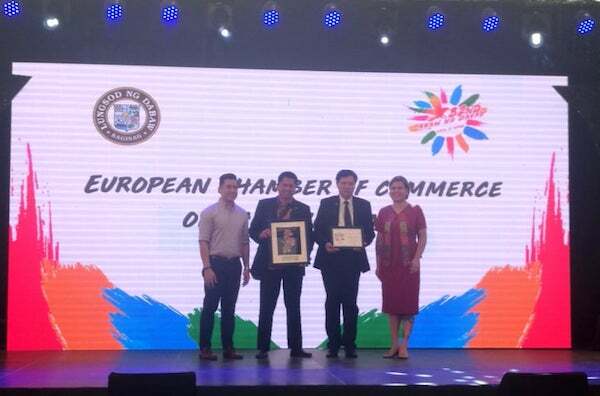 On March 15, 2019, the Davao branch of the European Chamber of Commerce of the Philippines (ECCP) was awarded by the City Government of Davao as the Best Foreign Chamber for its significant contributions to Davao’s business development in the past year. This is the second year in a row that the ECCP has received the award from the city. The award was personally handed over by Davao City Mayor Sara Z. Duterte and Davao City Investment and Promotion Center head, Lemuel Ortonio during the 82nd Araw ng Davao Celebration. ECCP Southern Mindanao Business Council (SMBC) Chairman Mr. Tony Peralta and ECCP-SMBC Member Dr. Amor Pendaliday received the award on the Chamber’s behalf. The ECCP is honored to once again be presented with this award and commends its Business Council and staff in Davao for a job well-done. We look forward to contributing even further positively to the business environment in Southern Mindanao in order to truly promote inclusive growth throughout the Philippines. For more information on how to participate in the ECCP Southern Mindanao Business Council, contact Davao Branch Officer Ms. Rachel Apoldo via rachel.apoldo@eccp.com.